We export Fire survival cables to Afghanistan, Albania, Algeria, American Samoa, Andorra, Angola, Anguilla , Argentina, Armenia, Aruba, Australia, Austria, Azerbaijan, Bahamas, Bahrain, Bangladesh, Barbados, Belarus, Belgium, Belize, Benin, Bermuda, Bhutan, Bolivia, Bosnia-Herzegovina, Botswana, Bouvet Island, Brazil, Brunei, Bulgaria, Burkina Faso, Burundi, Cambodia, Cameroon, Canada, Cape Verde, Cayman Islands, Central African Republic, Chad, Christmas Island, Cocos (Keeling) Islands, Colombia, Comoros, Congo, Congo, Costa Rica, Croatia, Cuba, Cyprus, Czech Republic, Denmark, Djibouti, Dominica, Dominican Republic, Ecuador, Egypt, El Salvador, Equatorial Guinea, Eritrea, Estonia, Ethiopia, Falkland Islands, Faroe Islands, Fiji, Finland, France, French Guiana, Gabon, Gambia, Georgia, Germany, Ghana, Gibraltar, Greece, Greenland, Grenada, Guadeloupe (French), Guam (USA), Guatemala, Guinea, Guinea Bissau, Guyana, Haiti, Holy See, Honduras, Hong Kong, Hungary, Iceland, India, Indonesia, Iran, Iraq, Ireland, Israel, Italy, Ivory Coast (Cote D`Ivoire), Jamaica, Japan, Jordan, Kazakhstan, Kenya, Kiribati, Kuwait, Kyrgyzstan, Laos, Latvia, Lebanon, Lesotho, Liberia, Libya, Liechtenstein, Lithuania, Luxembourg, Macau, Macedonia, Madagascar, Malawi, Malaysia, Maldives, Mali, Malta, Marshall Islands, Martinique (French), Mauritania, Mauritius, Mayotte, Mexico, Micronesia, Moldova, Monaco, Mongolia, Montenegro, Montserrat, Morocco, Mozambique, Myanmar, Namibia, Nauru, Nepal, Netherlands, Netherlands Antilles, New Caledonia (French), New Zealand, Nicaragua, Niger, Nigeria, Niue, Norfolk Island, North Korea, Northern Mariana Islands, Norway, Oman, Pakistan, Palau, Panama, Papua New Guinea, Paraguay, Peru, Philippines, Pitcairn Island, Poland, Polynesia (French), Portugal, Puerto Rico, Qatar, Russia, Rwanda, Saint Helena, Saint Kitts and Nevis, Saint Lucia, Saint Pierre and Miquelon, Samoa, San Marino, Saudi Arabia, Senegal, Serbia, Seychelles, Singapore, Slovakia, Slovenia, Solomon Islands, Somalia, South Africa , Taiwan, Tajikistan, tanzania, Thailand, Togo, Tonga, Tunisia, Turkey, Turkmenistan, Tuvalu, Taiwan, Turkey, Vanuatu, Venezuela, Vietnam, Yemen, Zambia & Zimbawe. The Construction of Fire Resistant Cable are different from the ordinary Fire Alarm cables. The Copper Conductor is wrapped with a specially designed heat barrier Glass Mica Tape and fire resistant insulation layer is covered over glass mica tape, which resists the fire to reach conductor surface. The cable continues to remain into operation at high temperatures like 750°C and 950°C as per various conditions of operation and applications. The Test is carried out on the cable operation on load and burning at temperature of 750°C for 2 hours or 950°C For 3hours. The cable is put on clamps above the fir burner of hig flames. The power supply is connected to one end of the cable at rated voltage and the load is connected to other end. Fire applied for 3 hours and during this period, and the circuit integrity must be uninterrupted. After the 3 hours, the fire and power is switched off. The cable should report as usual when energized again after a gap of 12 hours. High Conductivity electrolytic Grade Annealed bare/Tinned Copper. Solid / Stranded / Multi Stranded Conductor. Pair/ Triad/Quad are laid up with suitable lay. Polyester Film/ Melenex Tape is provided to bind up laid up pair / Triad / Quad. Armouring is applied over inner sheath, it may consist of Galvanized Round Steel wire or Galvanized Flat Steel strips. FR PVC / FRLS PVC / LSZH / ZHFR. The Colour of Outer sheaths is generally Red. Building Automation Systems : High rise Buildings, Hospitals, Shopping Malls, Airpots, Power Plants, Chemical & Processing industries etc. Range : 0.5/ 0.75/1.0/1.5/2.5 SQ MM up to 48 Pair. We,Bhuwal Cable Limited a vast and experience of this domain, we have been able to offer a wide range of high grade Power Cables to our valuable customers. Available with us at highly affordable market prices, these cables are widely used for transferring high voltage electricity from one source to another. In addition to this, these cables are highly appreciated for their ability to withstand high temperatures. Size Single Core 0.5 To 300 Sq. Mm Multicore 4c*95 Sq. Mm & 40c*2.5 Sqmm F Type Cable. Fire Survival Cables are cables that are designed to continue to operate for a defined minimum period of time during a fire. 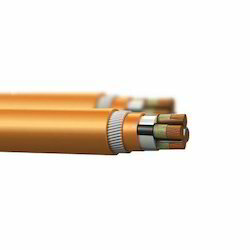 Fire Survival Cables are also known in the North American market as circuit integrity cables, since Fire Survival Cables are used in circuits that must be able to maintain their integrity during a fire. Many manufacturers refer to these products as “fire resistant” cables.